Red, Blue, & Green: The New Electric Rates are Real, and Coming Soon! The New Electric Rates are Real, and Coming Soon! A couple of months have passed since we first talked with our customers about the dramatically different way that electric bills will be calculated beginning January 2016, so maybe it is time for us to talk about it some more. These hot summer days are providing a great example for why the rates must change, and they also provide excellent opportunity for us all to practice changing the way we use energy so as to save money under the new rates. We can offer no better advice for all Glasgow residents than to urge you to go to https://portal.glasgow-ky.com/ and sign up/sign in to the EPB Meter Portal which is has been created for every account in the Glasgow EPB electric service area. 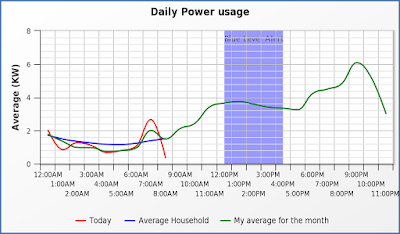 This real-time resource will help explain the new rates, give you comparison bills calculated using the old rate and the new rate so that you can see how the rate may impact you, and give you feedback on your efforts to reduce the all important "KW during our Peak" amount (the most dramatic difference between the old billing and the new billing rates). The graphic shown here is from that portal for one of our homes. See that blue highlighted area? That means that during those hours there is a high probability that Glasgow will hit a new maximum kW demand for the month. We are making these predictions and showing them to you in this easy to read format to remind everyone to make efforts to reduce electric power consumption during those hours. The new rate will track your actual contribution to community peak demands and you will be billed accordingly. So, what you should be practicing is your home's, or your business's response to these projected peak demands. 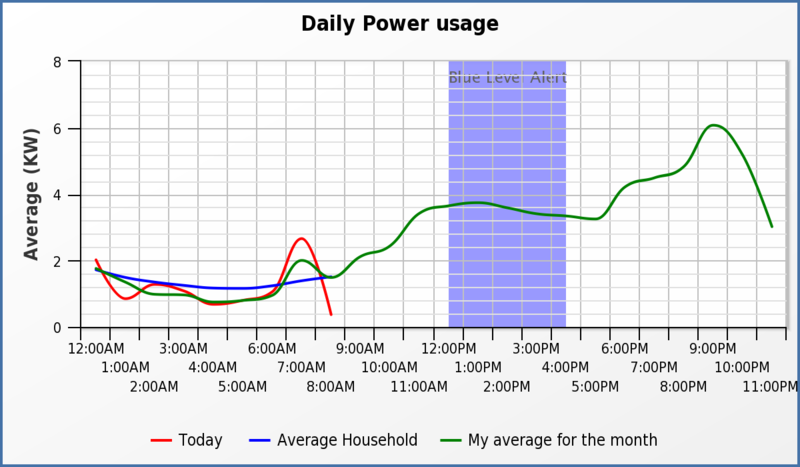 Keeping your red line on the graph low during the peak hours will result in a much smaller electric bill in 2016 and beyond. You can do that by moving your thermostat to a higher temperature during the afternoon and delaying any other power intensive activity. Now is the time to work on your understanding of this new electric rate concept. Next year, this will all become very real. We want you to be prepared.